Warm and sunny this morning but the winds picked up this afternoon and blew some clouds in. Yesterday afternoon we drove over to Galax to go to Wal-Mart for Frances to pick up some things at dinner at The Twisted Fork. Yummy Italian food. 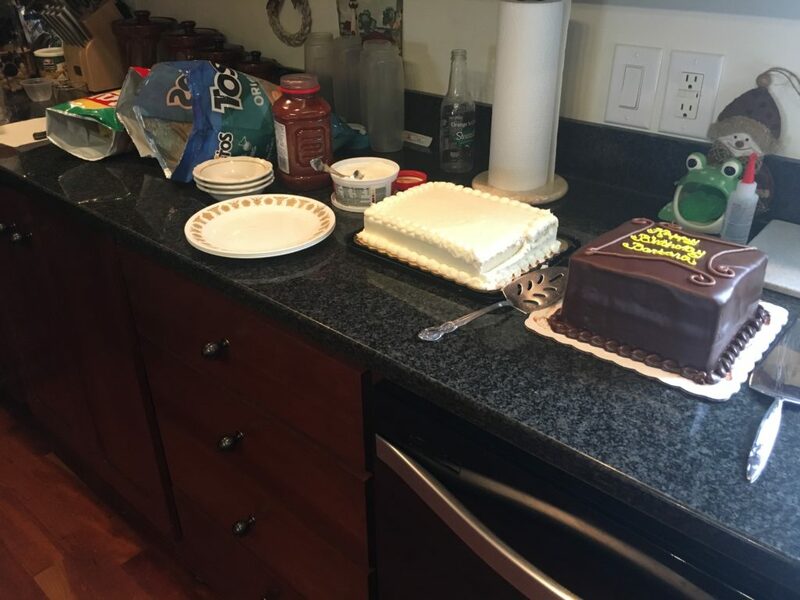 Today we celebrated my actual birthday with chips and birthday cake. Al put my new generator together as in putting on the wheels and getting everything hooked up. After adding the oil and enough gas to start it fired right up with the electric starter. They headed back to Winston awhile ago. Windy, cloudy, and warm today. Hi Barbara, A Happy Birthday to you! Sorry it’s a bit belated. I thought it was later in the month. Looks like a delicious cake. And I’ve got those corel dishes too!